JungleMail for Office 365 new Drag & Drop Builder lets you create original, colourful email messages, simply by dragging and dropping text boxes and images. HTML code skills are no longer required to create stunning campaigns. 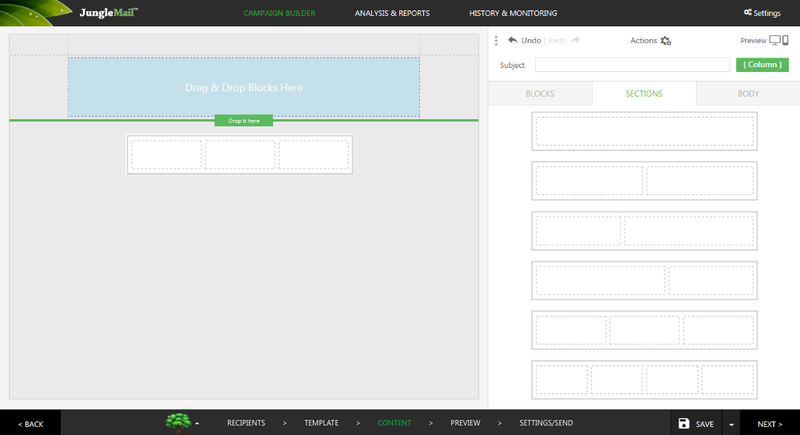 Here it is worth pointing out that all emails created with this template builder are responsive. That means that they will look good on any device or at any screen resolution. JungleMail 365's Drag & Drop Builder allows you to duplicate, delete, and rearrange content blocks on the fly. Drag and drop a variety of sections and content blocks into your layout and rearrange them to customize the look and feel of your campaign. In this tutorial, you will learn the basic skills needed to use the builder. If you want to find out more about sending newsletters in JungleMail for Office 365, also read our tutorial about sending newsletters. 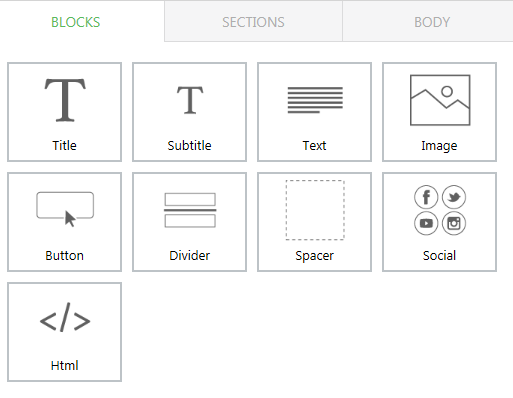 The new Drag & Drop Builder is easy to use. Open JungleMail 365 from the ribbon, and follow the steps in this tutorial to get acquainted with the builder. 1. 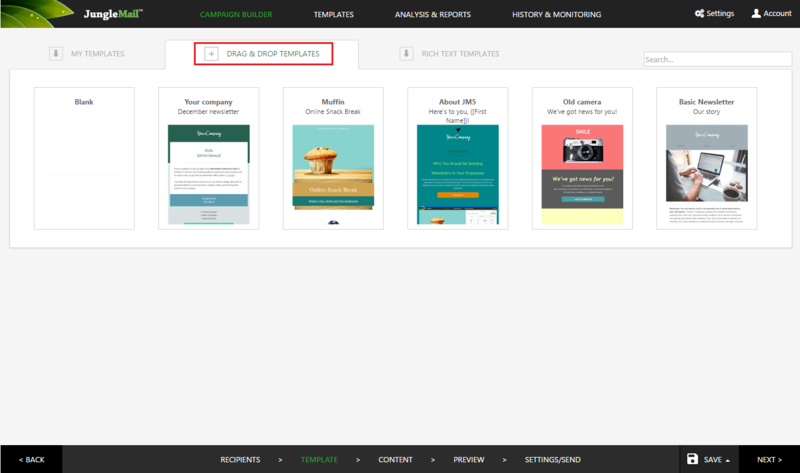 To get started, select one of the saved Drag & Drop Templates or a new Blank template. 2. Once you have chosen a template, you will continue onto the Content window. This window contains the available Sections and Blocks you will use to build your email. All of their general settings can be customized in the Body tab. During this step , you can also provide a Subject of your newsletter and use mail merge columns from recipients list to personalize subject line for every recipient. 3. Now you can start designing your email by simply dragging and dropping the sections you want to use into the email body. The Section acts as a container. It has between 1 to 4 column's in which you can drop blocks. Note: sections cannot be dropped inside other sections. Each section, by default, inherits the settings which are configured in the Body tab. However, each Section can have its own unique settings. A series of unique options that will help you configure the selected section will appear to the right. Here you will be able to find: Section background color, content background color, layout responsive (on/off), dynamic section (on/off), the section's column background color and padding, sections border type, color and width. 4. 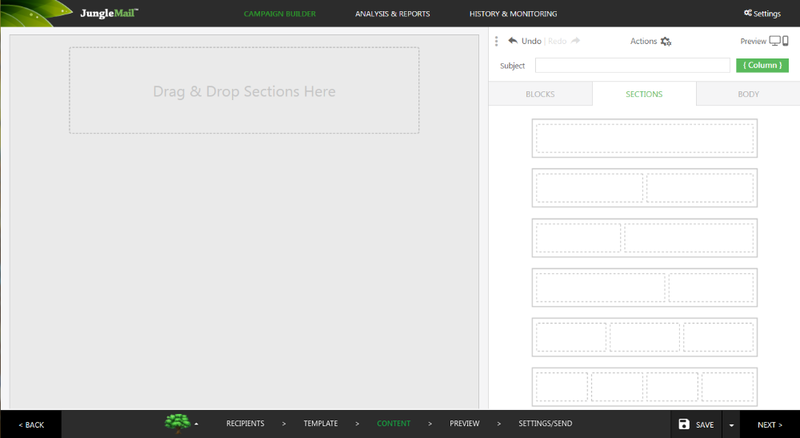 Next, you can insert blocks into the sections you placed in the email body. Here are the blocks you will find in JungleMail 365. 5. After you have dragged a block into one of the sections in your email body, a series of unique options that will help you configure that block will appear to the right. For example, if you just selected a text block, this is where you will be able to edit the text, change the background, fonts, and colors. And if, for example, you added an image block you will be able to choose a different image or upload a new one from this configuration window. 6. Any of the blocks you have inserted can be made dynamic. This makes they are linked to certain lists in your SharePoint which are then queried with the click of a button. This is an easy way to personalize emails and save you time. To learn more about Dynamic Blocks and Sections, click here. The builder is pretty straight forward to use. If anything is unclear about the blocks, we've included a more detailed description for each one of them below. Note: by default , the block will inherit the style settings from the section it is inserted to ,. However, you can easily override these settings by configuring the settings for the block. Social Social icons so recipients can follow you or your company on social networks. icon set (5 designs), five social media icon options (Facebook, Twitter, Google Plus, Youtube, LinkedIn) all of which can be fully customized to match your individual branding and design. You can remove unnecessary icons or add them more.